This quick and easy vegan meal is delicious plain or with a dollop of Greek yogurt. It was such a huge hit with my family, I decided to mix the leftovers with egg and bake a tasty casserole topped with cheese (Check out my Quinoa Black Bean Casserole). Try both yummy recipes! Coat pan liberally with oil spray. Add mushrooms, and cook for 1 to 2 minutes. Next, add the red pepper and cook for an additional 1 to 2 minutes. And finally toss in the kale and cook 2 to 3 more minutes. Mix in taco seasoning. 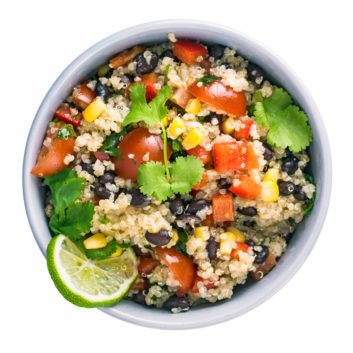 Turn off heat and stir in the black beans and cooked quinoa. Season with Kosher salt and ground black pepper to taste.